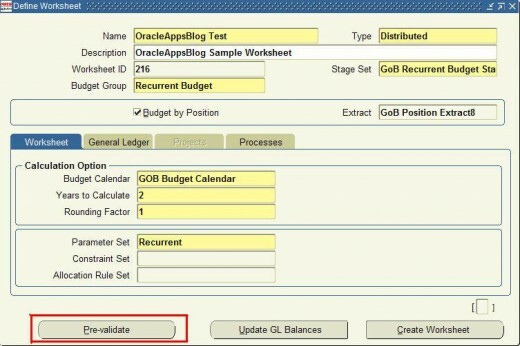 This post discussses the pre-validate worksheet option for position budgeting which is now available in the Define Worksheet Form. Recently when defining a PSB Worksheet I noticed that on the Define Worksheet Form (Form Name: PSBWCDWS) there is now a "Pre-Validate" button. The button is positioned on the bottom left hand side of the form and can only be used if you have checked the "Budget by Position" checkbox and specified a Position Extract (refer to Fig.1). I was curious to know what this button was all about as I hadn’t noticed it before and after some investigation discovered that it was a new feature released as a result of an enhancement request per bug no. 324574 on Metalink. The Pre-Validate worksheet option is meant to proactively validate position records before starting the worksheet creation process. In other words, before starting the worksheet creation process you can separately validate whether the positions have the correct salary information and distributions for the worksheet. Previously there was no option to perform a separate validation of the positions outside of the worksheet creation process. This meant that one would have to run a potentially long worksheet creation process to determine whether the position information was correct. The Position Worksheet Exception report lists all the problematic position records. After you have eliminated any potential problems with the position information you can then run the worksheet creation process. In order to "install" the Pre-Validate Button you will need to load Minipack J for PSB which will deliver the new version (11.5.44) of the Define Worksheet form.